The University of Canterbury has officially opened its new School of Product Design. From left to right are: Head of the School of Product Design Professor Conan Fee, University of Canterbury Vice-Chancellor Dr Rod Carr, Minister of Research, Science and Innovation Dr Megan Woods, and Pro-Vice Chancellor of the College of Engineering Professor Jan Evans-Freeman at the official opening of the University’s new School of Product Design. 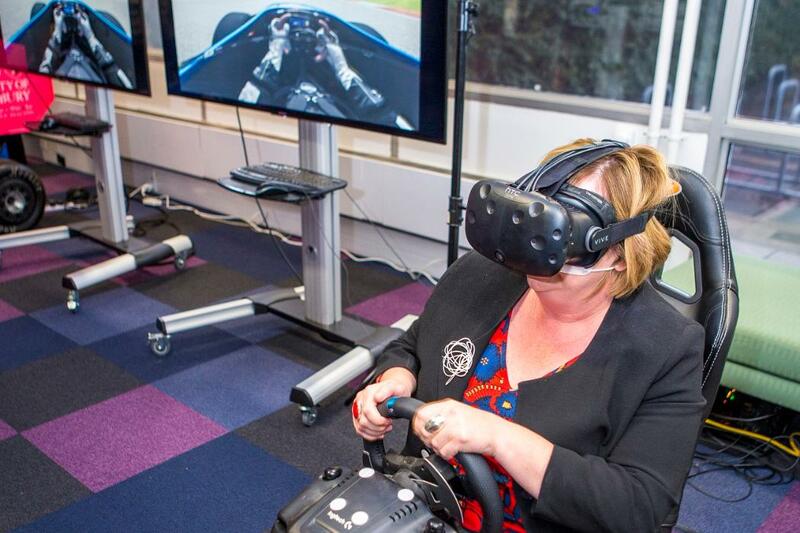 Hon Dr Megan Woods plays an immersive virtual reality (VR) car racing game at the opening of the School of Product Design at the University of Canterbury, last night. The new School offers a degree in Applied Immersive Game Design. The Minister of Research, Science and Innovation, Hon Dr Megan Woods opened the new Engineering school last night at an official celebration of the realisation of the School, which is part of UC’s College of Engineering. Minister Woods spoke about the growing importance of combining the arts and creative sectors with science, engineering and business to put New Zealand products on the world stage in a rapidly changing environment, and how important it is for industry to support the new School, its current students and future graduates. The only university offering Product Design degrees in the South Island, UC has welcomed 140 new students into the first intake of Product Design degree courses this year. The new students join growing numbers in the College of Engineering, with an increase in enrolments across all the five Colleges of UC this year. A brand new degree programme two years in the making, the School of Product Design offers majors in Industrial Product Design, Applied Immersive Game Design, and Chemical, Natural and Healthcare Product Formulation. It’s a truly modern degree that combines Science and Engineering (50%), Creative Design (33%) and Business (17%) courses. The head of the new School of Product Design, Professor Conan Fee says the new degree programme is aimed at producing “creative, technically savvy graduates who are business-ready”. “It is important to understand that product designers do not simply add the window dressing, the artistic surface coating to make a functional product look attractive, but rather they engage in the entire process of problem solving,” he says. For example, the Chemical, Natural & Healthcare Product Formulation programme is unique in the Southern Hemisphere, Professor Fee says, and leads to career paths in a growth area, with household products a trillion-dollar industry sector globally, creating everything from weedkillers to lipsticks. The EPECentre is pleased to welcome Dr Radnya Mukhedkar, a leading professional in the energy industry, as their new director.